Ok...so it's June. We did have a little rain today. Then I was reminded that I had a couple of layouts saved as a blog draft. Oops...I'll share them with you now. 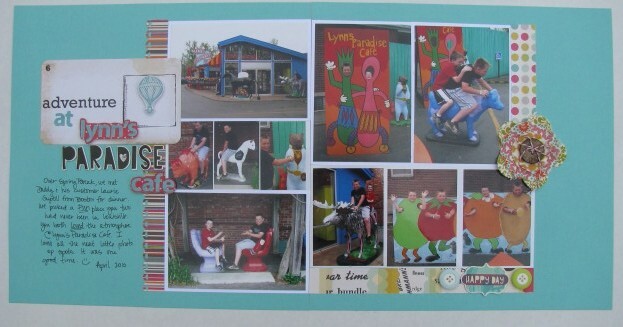 I used the April Studio Calico kit(s) for these projects. 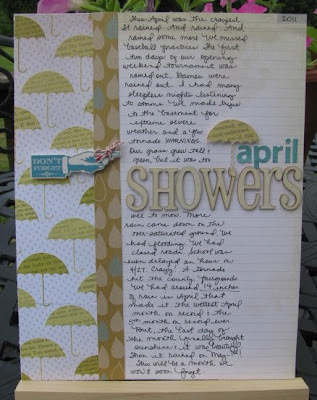 I thought the Studio Calico paper with umbrellas was perfect for telling about our WET, WET, WET month of April. I also loved the American Crafts' raindrop paper. The wood alphas from Pink Paislee were my favorite alpha from the kit. The Cosmo Cricket chipboard alphas fit in great with the photos - quite eclectic. 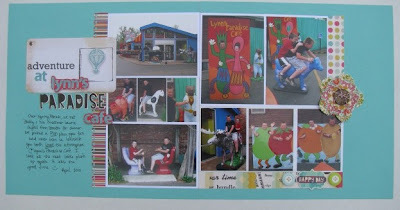 I used a Pink Paislee hot air balloon adhered with pop dots over top a Pink Paislee card with the same hot air balloon. Plus, I was able to work in some flowers (Basic Grey canvas flowers) in on this non-feminine layout. Thanks for looking! Those canvas flowers are awesome--they look really good layered.